This XXL kayak is designed for longer trips. With his good load capacity and security that gives to the paddlers is the perfect choice for any tandem tour for a day or for a week. This kayak is safe, stable and seaworthy even in challenging waters. Double Trouble greenland style lines enhances speed and stability, and allows bow to punch through waves instead of riding up and over them. Suitable for newbies. Plans can still be downloaded from here, but you can visit yaKayak new site and download from there new or improved version of plans. New site is still under active development, but free plans are available for download. como faço para imprimir a planta no tamanho real? Ocean worthy ? Foam composite? Hi Frederick, I don't know about foamboards way of building. Probably it's possible with some extra work to keep everything strong and together. 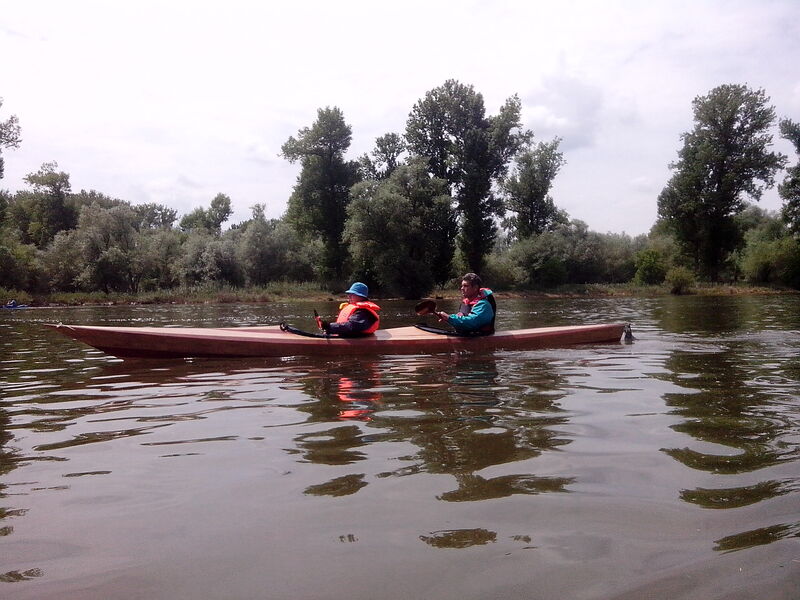 I've paddled this tandem kayak just in rivers, but on Danube river, sometime wind and waves are just like in sea. And all this kayaks performs very well. NoName is builded and paddled in England from Freedom Kayaks Ltd (under name Fulmar) in sea and reviews are good. I'm not so experienced paddler, but just have returned from Greece and there Anuket was exellent in sea with strong wind and rough weather for several days. So, yes - they are sea worthy. I think i might give it a try. Where xan i purchase the plans for tge doubletrouble and how much do they cost with shipping to Malta EU? Hi Frederick, You can download plans for free. On top of this content there is a link Download, or if you visit http://cmamyc.com/yakayak/node/17/download/17 But recently some people have problems with DoubleTrouble downloads, so you can use contact form to get your e-mail address and i will send them to you. I managed to download the files but thought if you had them for sale printed and shipped it would have been nicer purchasing tbem from here instead of paying 3rd parties for printing services. Please send the plans for Double Trouble. I'm getting ready to build a stitch&glue double for myself and my wife. We have no lakes or rivers here but the sea beach at our doorstep plus 3 islands each within 10 - 11 km. The waters are choppy up to 1 m, the winds are usually 10 - 15 knots. I intend to sail it rather than paddle. Any advice here or by return mail will be appreciated. Thanks, Edward. can I have plans for a stitch and glue tandem caiac? can I have free plans of a stitch and glue tandem caiac? Hi, you can find bulkhead places in offset tables (on bottom parts). Sorry, but 3d models will work only on my new site which is still in development. But sections missing from 3d model anyway.